First of all, we want to stress that ticks don’t recognize state or county lines. Lyme disease is everywhere, even in the Arklatex! According to the International Lyme and Associated Diseases Society (ILADS)…………. 1. Lyme disease is transmitted by the bite of a tick, and the disease is prevalent across the United States and throughout the world. (No one is immune to it). 1. Lyme disease is a clinical diagnosis, meaning that diagnosis cannot be relied on test results alone. It is caused by a spiral-shaped bacteria (spirochete) called Borrelia burgdorferi. (It can infect multiple organs). 3. Less than half of patients with Lyme disease recall a tick bite. (Some studies suggest only 15%). 4. Fewer than 50% of patients with Lyme disease recall any rash. (It is not the most common dermatologic manifestation of early Lyme infection). 5. The Centers for Disease Control and Prevention (CDC) surveillance criteria for Lyme disease were devised to track a narrow band of cases for epidemiologic purposes. The surveillance criteria were never intended to be used as diagnostic criteria. 6. The ELISA screening test is unreliable. The test misses 35% of culture proven Lyme disease (only 65% sensitivity) and is unacceptable as the first step of a two-step screening protocol. 7. Of patients with acute culture-proven Lyme disease, 20–30% remain seronegative on serial Western Blot sampling. The CDC eliminated from the Western Blot analysis the reading of bands 31 and 34 which are highly indicative of Borrelia burgdorferi exposure. Yet these bands are not reported in commercial Lyme tests. 8. When used as part of a diagnostic evaluation for Lyme disease, the Western Blot should be performed by a laboratory that reads and reports all of the bands related to Borrelia burgdorferi. Laboratories that use FDA approved kits (for instance, the Mardx Marblot®) are restricted from reporting all of the bands, as they must abide by the rules of the manufacturer. 9. There are 5 subspecies of Borrelia burgdorferi, over 100 strains in the US, and 300 strains worldwide. 10. Testing for Babesia, Anaplasma, Ehrlichia and Bartonella (other tick-transmitted organisms) should be performed. 11. A preponderance of evidence indicates that active ongoing spirochetal infection with or without other tick-borne coinfections is the cause of the persistent symptoms in chronic Lyme disease. 12. There has never been a study demonstrating that 30 days of antibiotic treatment cures chronic Lyme disease. (Short treatment courses have resulted in upwards of a 40% relapse rate, especially if treatment is delayed). 13. Most cases of chronic Lyme disease require an extended course of antibiotic therapy to achieve symptomatic relief. (The very real consequences of untreated chronic persistent Lyme infection far outweigh the potential consequences of long-term antibiotic therapy). 14. Many patients with chronic Lyme disease require prolonged treatment until the patient is symptom-free. (There are no tests currently available to prove that the organism is eradicated or that the patient with chronic Lyme disease is cured). 15. Like syphilis in the 19th century, Lyme disease has been called the great imitator. The Center for Disease Control records about 20,000 Lyme cases per year. Only 10% of the cases that meet their “surveillance case definition” are actually reported. This means that as many as 200,000 or more new infections may occur each year. The IDSA denies that Lyme bacteria can persist in the body after a short course (1-2 months) of antibiotic therapy. 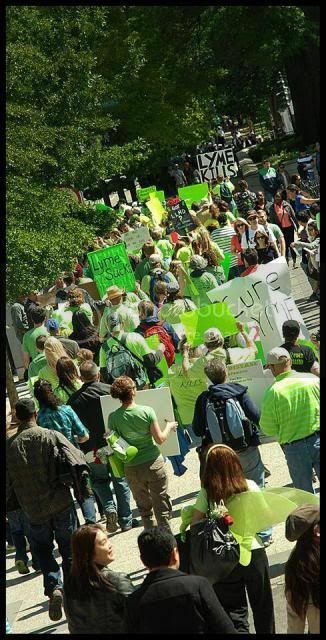 ILADS doctors (Lyme Literate Medical Doctors) who disagree with short term treatment recommended by the IDSA may become targets of investigations by their state medical board for breaking standard treatment guidelines with the IDSA. “The IDSA’s 2006 Lyme disease guideline panel undercut its credibility by allowing individuals with financial interests — in drug companies, Lyme disease diagnostic tests, patents and consulting arrangements with insurance companies — to exclude divergent medical evidence and opinion.” As stated by Connecticut Attorney-General Richard Blumenthal said in a 2008 news release. Eight U.S. states — Connecticut, Maryland, Massachusetts, Minnesota, New Jersey, New Hampshire, Pennsylvania and Rhode Island — have passed laws to allow doctors to prescribe long-term antibiotics for the treatment of Lyme disease. Lyme disease rashes can be mistaken for spider bites or skin infections.